Russia defeated Slovakia 8:3 on Wednesday night, with the Russian team scoring four goals in the first period, three more in the second, and one in the third. The Slovaks made a respectable late-game attempt to catch up in the third period, scoring three goals, but it was not enough to catch the Russians, who now advance to the semifinals, and will face off against the United States on Friday. 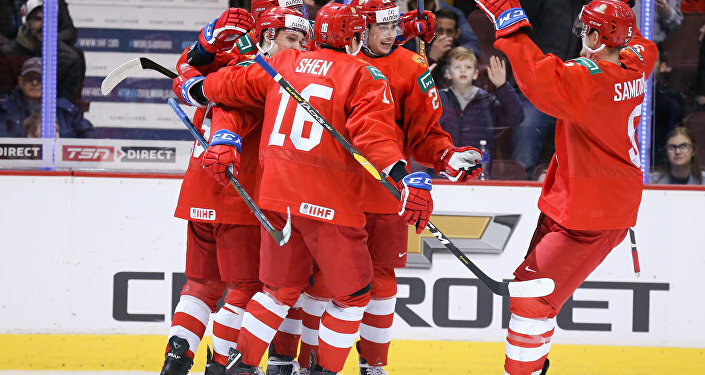 Grigory Denisenko, Alexander Alexeyev, Stepan Starkov, Nikita Shashkov, Kirill Slepets and Ilya Morozov each racked up a goal during the game, with Klim Kostin netting two. Slovak goal scorers included Martin Fehervari, Roman Milos and Michal Ivan. The Russian team has now won all four matches in the group stage, and the quarterfinals. Also Wednesday, Switzerland unexpected upset the traditionally strong Swedes 2-0, pitting the former against the equally formidable Finns on Friday. Finland shut out the Canadians 2-1 with less than a minute to go in the third period, while the United States defeated the Czechs 3-1. The Juniors' championship game will take place January 5 between the winners of Friday's games.